How to add multi-step or multi-page forms is a frequent request. 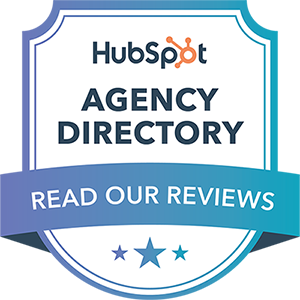 HubSpot forms are designed to be single-page forms, but they do offer some less than ideal workarounds or you could use a service like Typeform and integrate it into your HubSpot account. To solve this problem natively, I've created a HubSpot custom module that allows you to quickly create a set of slides, each containing their own form so that you can gradually capture lead data. You can view a demo of the form and test it out here. Customisation: need even more functionality? I can add more features on request! Add logic, a calculator, smart content based on responses, icons instead of numbers... etc. Once the module has been added to your template, you can click on it to access the module's options. On the left hand sidebar you'll see four sections that will allow you to customise the module. 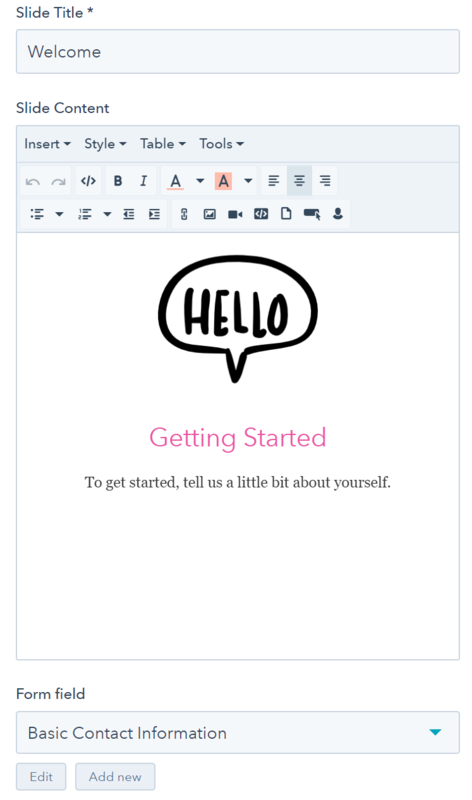 Note that the font for the header and the form formatting should be pulled directly from your website's theme to match the rest of your content. Choose the option to add a redirect message below, but note that this will not be visible to the user. You only need to add a visible Email form field to the form on the first slide. After the first slide, the email address will automatically be pulled from the previous slide so you can set the field to Hidden on other forms (note that you'll need to remove the Required option first). The last slide is very similar to the Slides above, but does not have a form. 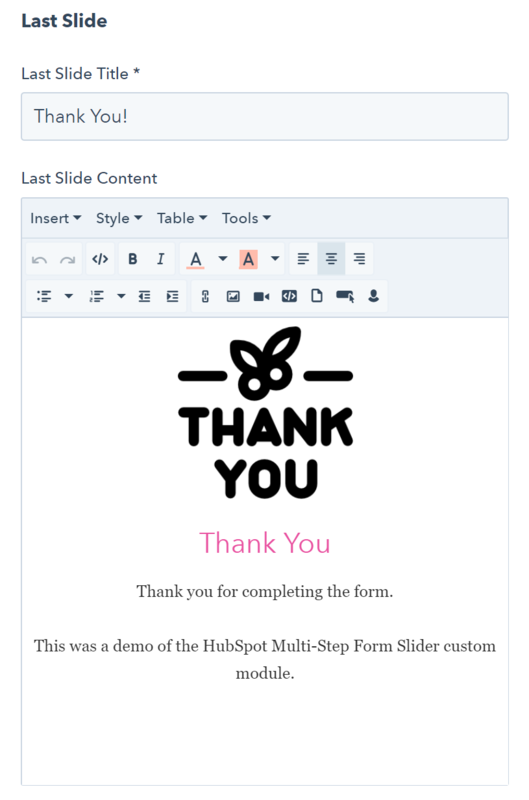 In the Last Slide Content area, you can add in your thank you message. Background Colour: overall background colour. You can add a single colour or multiple for a gradient effect. 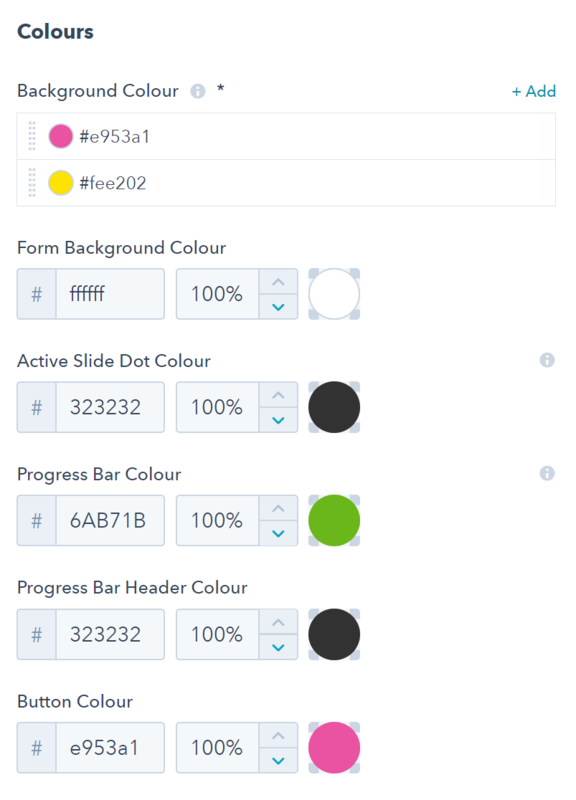 Form Background Colour: the colour that appears behind the content on each slide. Button Colour: the form's submit button colour. You can also choose the form width (while it's responsive, this is the maximum width of the form) and hide the headers. If you have many slides this may come in handy as not all of the slide headers will fit above. When you have finished with your customisations, be sure to click on "Apply" at the bottom to make sure they're reflected on your page! If you have any additional questions on the module, please don't hesitate to get in touch!